We have a new shelf in our house. Once we put up all of our books we realized that some space was still empty. It did not take long until I saw that the hight of the “rooms” were perfect for Barbie. 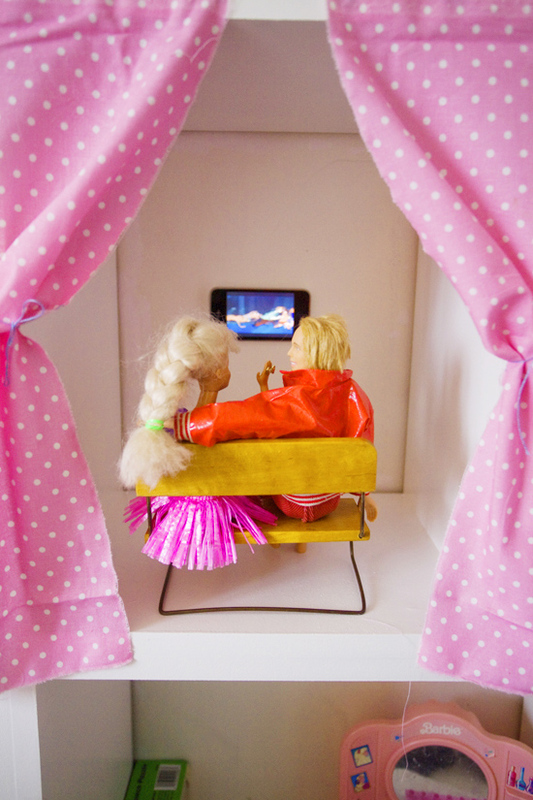 With some furniture, fabric and an Iphone me and Viola made a cinema-theater, an office and a lounge. The curtains and the flags are my favorite things. I love making miniature things, they are so quick to make compared to real life size. PS. Notice how Shaggy has taken Barbie to see an episode of Scooby Doo. But the couple did not get to see the end because Viola got so intrigued by the movie she stole the screen from them and crawled “downstairs” and finished it on her own. så fint! jag älskar hur viola har en så självklar plats i hela ert hem, att hon inte bara får leka i sitt rum. Så himla fint, Jenny! Håller med Märta, så gott när huset är allas! I love it! You made such beautiful miniature things! Thank you. Yr comments are always so sunny.